Getaria is a gorgeous, historic and picturesque village located on the rugged Costa Vasca in northern Spain, whose tiny population of just over 2500 people swells in the summer when visitors in the know arrive to enjoy its wonderful beaches and vibrant fish restaurants. It is undoubtedly the unspoiled Basque Coast’s finest small destination, a mere 20 minutes’ drive away from elegant, upmarket San-Sebastian. Getaria has long been known as a fishing and mariners’ village, although its early history is not totally clear. We know that the original Celtic Basque inhabitants – who may be Europe’s oldest race – settled on Spain’s northeastern coastline and were largely isolated from outside influences until the Romans conquered what was then known as Iberia in the 2nd century AD. For over 300 years the Romans controlled Spain until the Western Empire collapsed due to attacks from tribes from northern Europe in the mid-5th century. However, recent archaeological excavations in Getaria have uncovered evidence that the town was indeed founded during the Roman period, which for centuries after would be dependent on the sea for its livelihood. But despite being settled during the Roman occupation of Spain, the Basque inhabitants, long isolated by their mountain valleys were mostly unaffected by Roman rule and their culture has remained today preserved from outside influence. Thereafter, the village disappeared into obscurity for several centuries, until Getaria was officially declared a villa or place of preconceived origin, by King Alfonso VIII of Castile in 1209. Prior to the 13th century, Getaria was part of the Kingdom of Navarra until Castile annexed the region in 1200. A thriving fishing and whaling industry developed in the Middle Ages and the area’s population and prosperity grew during this golden era of sea-faring. Indeed, the Basque country was actually the first region in the world to commercially hunt whales and for five centuries they dominated the whale trade. Geteria’s narrow streets were soon filled with fine mansions and town-houses, as the newly wealthy sought to advertise their good fortune. A crucial event in Getarias’ and the regions’ history took place in the late 14th century, one which would have a lasting effect on the area for centuries after. In 1397, the Hermandad de Guipuzcoa – Gipuzkoa’s Brotherhood – met in the village in a historic session that laid the legal foundation for the development of the Gipuzkoa semi-independent province. The 15th century would bring more prosperity and fame to this once ignored Basque provincial settlement, as one of Spain’s most revered and famous sailors – Juan Sebastián Elcano – would be born in Getaria in 1476. It was also during this period that the village, which had previously existed as a port and group of houses on an island separated from the coast, was connected to the mainland by a pier. 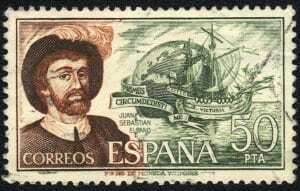 Juan Sebastián Elcano’s fame largely resulted from his historic voyage with Ferdinand Magellan, who set out to circumnavigate the globe in the 16th century. Elcano thereafter completed the voyage and became the first person to circumnavigate the world in history. Only one ship – the Victoria – survived the voyage with just 18 men out of several hundred returning home. Emperor Charles V awarded Elcano a coat of arms and he became the most revered figure in Spain. Elcano died at sea in 1526, but left his remaining wealth to every church and chapel in Getaria, in addition to other regional buildings across the Basque country. The 17th and 18th centuries would herald more prosperity for the inhabitants of Getaria. Its importance as a center of fishing and whaling grew, which lasted until the mid-19th century when the last whale to be captured in the Atlantic coastal waters was caught in 1878. However, Getaria and the entire Basque region suffered during the Peninsular War between the allied powers of the UK, Spain, and Portugal and Napoleon’s France. The neighboring Basque city of San-Sebastian was occupied by French forces in 1808, although it was subsequently retaken by Allied troops three days later. At the end of the 19th century, one of Getaria’s other most notable residents was born – the fashion designer Cristóbal Balenciaga Eizaguirre. He founded the fashion label Balenciaga and his designs were the toast of Europe’s elite in the mid-20th century. His most famous creation was the wedding dress for Fabiola de Mora y Aragon, for her marriage to King Baudouin I of Belgium. His death in 1972 was a great loss to the fashion world, although today the brand is owned by Gucci. Despite the wars of the 19th century, it is during this period that the initial signs of a modern wine industry began developing in Rioja, with the first Bodega (winery) being founded in 1860 in the shape of Marques de Riscal. The Catalyst for this development was Phylloxera, a parasite that destroyed almost all of the vineyards in Bordeaux. This crisis encouraged French winemakers to look further afield and many experts from Bordeaux came to Rioja Alta and the lands surrounding Briones in the nineteenth century to found wine estates. They discovered favorable conditions for growing what are today the local varieties (Tempranillo, Garnacha, Mazuelo and Graciano) and also brought with them the first Cabernet Sauvignon vines. And so, a vibrant wine industry was born! The most important historical event in the 20th century for the residents of Getaria, and indeed every person in the Basque country was the Spanish Civil War between the Nationals, who supported General Franco and the liberal Republicans. The war claimed the lives of over 700,000 Spanish nationals, after Franco’s victory in 1936 he remained Spain’s dictator until his death in 1975. Getaria and the entire Basque country was firmly on the side of the Republicans, after Franco took control of Spain he heavily suppressed the citizens of the Basque country, banning the Basque language and removing all their regional autonomy. Franco’s death heralded a new lease of life for Getaria and the Basque country, the new democratic government re-introduced the region’s semi-autonomous state and its proud citizens could once again celebrate their unique language and culture. Their wine heritage was given official recognition in 1989, as the Txakoli grape variety, long cultivated in the hills surrounding Getaria was given its own D.O. or appellation. Today it forms one of the three Basque regions that are entitled to use the Txakoli designation. Despite having long been the preserve of Basque locals, Getaria is now starting to find favor with an appreciate audience further afield, who stay to enjoy the village’s wonderful gastronomy, vibrant cultural scene, beautiful coastline and warm, inviting atmosphere. Its appeal chiefly lies in the complete lack of development and almost timeless quality of the village – despite population growth and civic improvements, Getaria largely remains as it was over 100 years ago. It’s the perfect excuse to stay that extra day in the wonderful Basque country! The Basques – as any citizen will happily tell you! – are renowned in Spain for the quality, vibrancy, and inventiveness of their gastronomy. Just look at the nearby glamorous resort of San-Sebastian, which has over 8 Michelin starred restaurants to its name. Some of Europe’s most famous chefs emanate from this region, and their modern interpretations of Basque cuisine has become the default recognized haute cuisine style across Spain. At its finest, however, Basque cuisine focuses on high quality, local ingredients in season rather than elaborate sauces or spice combinations. Here food isn’t just a matter of life and death, it’s far more important than that! Getaria, like most Basque cities and towns, has a local gastronomy club where Basque men gather to cook, eat, drink and talk. However, visitors are usually not allowed to take part in these events, and until recently women were banned from attending too! So, your first port of call should undoubtedly be Getaria’s medieval small center, which has a surprising amount of traditional pincho bars full of inventive, Basque tapas and local wines by the glass. Lovers of crisp, light and refreshing white wines are in for a treat, as Getaria is one of the three Txakoli producing regions in the Basque country. Good restaurants in the area, however, will serve a selection of wines from across Spain’s best regions. There is usually an emphasis on the delectable wines of Rioja, some of which are produced in the Basque province of Alava. This beautiful Gothic church was built between the 16th and 17th centuries and has been declared a national monument. It is remarkable, not least for how seamlessly the church is integrated into the village’s defensive walls. In the 19th century, the church was repaired because of damages suffered during the Carlist Wars of the period. Its original architect was Pedro de Alzaga, who started the project in 1525. Truly a special place to visit. Fashion lovers should head straight to Getaria’s Balenciaga museum, dedicated to Spain’s most famous fashion designer of the 20th century, who was born here. The museum has over 1000 different items of clothing that he designed and is the first museum dedicated exclusively to a fashion icon. The imposing splendor of Getaria’s main square is a monument to its most famous former resident – Juan Sebastián Elcano. 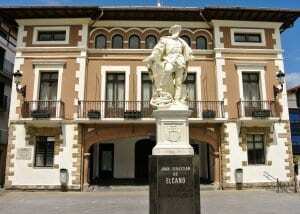 The Elcano statue was made in 1859 by the artist Antonio Palao and inaugurated on May 28, 1861. However, this statue was formerly located in neighboring San Sebastian for many years and was only returned to Getaria in 1978. Merely a 30-minute drive away from Getaria, this beautiful and up-market seaside resort is a must visit for anyone who steps foot in the Basque country. The main beach of the Playa de La Concha is one of the finest in the region and attracts hordes of visitors in the summer. San-Sebastian is also endowed with many fine restaurants and is arguably the best city to go looking for fine cuisine in Spain. Seafood is unsurprisingly for a fishing port, Getaria’s specialty, and fish lovers should head to the renowned fish restaurant Elkano, on the Paseo República Argentina. 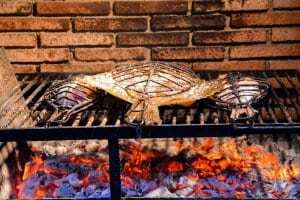 Widely considered to be one of the best seafood restaurants in Spain, head chef Pedro Arregui, aided by grill master Luís Manterola serves exquisite shellfish, lobster, wild turbot and salted cod to name just a few highlights. Everything is daily fresh, seasonal and perfectly cooked – the difficulty of securing a table in even low-season speaks volumes.